When you import raw files into Lightroom, you see the results of Fuji’s film simulation in the Import dialog box and also briefly in Library. Adobe’s own raw conversion then takes over and you get the Adobe look. 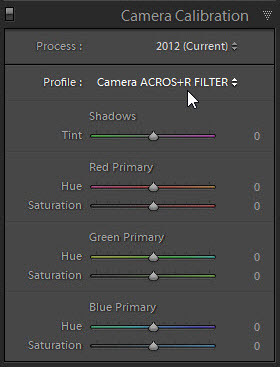 If you want Fuji’s film simulation colours in Lightroom, Develop’s Camera Calibration panel offers “profiles”. Adobe developed these in conjunction with Fujifilm engineers and they are quite close. But there’s no way to tell which film simulation you used for a photo or set of photos. If you only used one film simulation that day, you can probably remember and can just set the profile yourself. But what if you aren’t sure, or if you took lots of photos and varied which film simulations you used? Did you choose Acros+Red or Acros+Green for that photo? X-LR was designed to quickly and automatically overcome this problem, and it then developed extra features such as handling ratings and the Expert Mode. The plugin’s title “jb X-LR” is itself grayed out, but the actual menu Apply…. should be enabled. X-LR is tested on Mac and PC, and for Lightroom 5 or later. It will not run on Lightroom 4 or earlier. If your camera is too new for your version of Lightroom, the plugin will not be any benefit. In that case, I recommend that your best way forward is to upgrade to the current version of Lightroom which for some people will also mean that you take advantage of its greatly-improved rendering of Fuji files. If you want assistance, feel free to email me or to add a comment. I try to respond quickly. By the way, I’d love to hear where you heard of X-LR and what you think of the plugin. Hello, I am Korean. I can’t read English. I read Fuji Film Simulation in the title and bought it. But I’m using a Sony camera. I’m really sorry, but you should know if I can get a refund. Hi, I have just processed the refund. Please email me if you don’t see it. Still getting this when even trying to use it on one image! Bought the registration version as well. Every time, even after a restart of LR? The message would tend to happen if there is no Fuji EXIF, so what type of files are these? And can you run the plugin with the logging enabled? Another method will be to join with increased than one site to savor many freerolls. Adobe have caused a lot of confusion with the product names, so what do you mean by “LR CC the latest version”? The plugin is totally compatible with Lightroom Classic CC 8.2 and the X-H1. But it does not work with Adobe’s cloud-dependent Lightroom CC. I am the user of X-LR, it’s great product, but I have 2 questions. (1) LR does not support Fuji lens correction, is it possible to add FUJI lens correction function in X-LR? (2) If I take a RAW, can I get a variety of film simulations? Or I can only simulate which mode I use to shot. I’ve installed this plugin and try to use it on lightroom classic. I’ve just import one photo then click “apply the film simulation…” didn’t check/uncheck anything. An internal error has occured. func_extract.lua:139: attempt to index local ‘jsonData’ (a nil value). Any suggestions for this error? Usually that is because the photo doesn’t contain any Fuji EXIF data. What type of file is it? I Have the same issue… Any help? Usually that’s because either the raw file or (more likely) the jpeg don’t contain metadata or is damaged. See if you can identify which file causes the problem. https://www.dropbox.com/s/wkqviuzamful1uo/jb_XLR.lrplugin.zip?dl=0 which should not be affected by this problem. Great plugin – I’ve relied on this for the last nine months since I discovered it. I recently upgraded to the X-T3 and have been impatiently waiting for Lightroom support. Now that LR8 is finally with us, along with support for the X-T3, I find that the current plugin (1.41.2.0) doesn’t find any of my Develop presents any more. Is this a known issue? Adobe did make major changes to the presets mechanism in 7.3 and these could be relevant. You may have to run the plugin and set the presets again. Give this a try and let me know – email me directly for a quicker response. Glad you like the plugin. When I use the plugin through the latest version of Lightroom Classic CC it is now adding a 1 stop increase in exposure to the files. Can you explain why this might be? Also, I have a sharpening preset that I want to be able to apply but this naturally counteracts the fujifilm film simulation setting. Any ideas if I can combine the two presets? It would not be the plugin on its own that is adding the stop. My guess is that it’ll be the DR setting. You can’t apply two presets with the plugin (OK, you can with the unsupported expert mode) but in fact the plugin applies the film simulation as a profile, leaving you free to set the sharpening preset. Thanks John – how would I identify if it’s trying to apply two settings at the same time and how would I check the DR settings? Settings – by reviewing the dialog box carefully. By default, the plugin would simply not apply more than one preset. DR – easy way is to enable the keyword feature on the options tab. X-LR then creates keywords for each Fuji setting and the DR ones are quite obvious. Does this plugin works only with Fuji Raw files or can i use it also for Canon Raw files? It is Fuji files only, as it is intended to sync Adobe’s profiles with those built into Fuji cameras. Quick note… if anybody is having difficulty with the registration codes not working correctly, make sure to type it in manually. Avoid copying and pasting because you might pick up some hidden HTML/code that will mess it up (this is for any website/field box). My registration code wasn’t working at first but I realized it was user error right away. Good point. It’s probably the most frequent reason for people not being able to to unlock the plugin. I’ll try to make it more obvious. In the email that was sent to you a month ago. Maybe check your spam folder? In any case, I have just resent it. Is there a way to change the name (jb X-LR) that shows up in the history panel? I’d like to add something to it, for instance “jb X-LR + Sharpen” so i know that I always add one of my presets to the plugin’s use. There isn’t a way, sorry. LR requires the plugin’s name. just downloaded and tried your plugin and i am not sure I am using it correctly, but the issue I am trying to solve is: I took some bracketing RAW shots and they appear all the same in LR CC classic, even though the ISO is +- 1… maybe there is a solution for this in the way to set the plugin? It sounds like you have hit the Auto button in Develop. Or it might be the DR settings. The “More adjustments” tab might be set to change sliders if it detects DR200 or 400. Can you please explain the expert mode. I get an error message. Thank you. http://lightroomsolutions.com/jb-xlr/x-lr-expert-mode/ explains it, Tim. But it’s hard to comment more without knowing what you are trying to achieve and what the error message is. Do you have any suggestion what I should do. Trial version. 1.4 Downloaded today. Photos already loaded into LR catalog. Plug-in is there, and I can access the dialog box. I disabled other plug-ins so as to isolate and try to eliminate any possible conflicts. Leave all boxes checked. In dropdown there are NO Fuji film sims, just a bunch of LR and other presets that I have downloaded from other sources. When I click “Ok” just to see what happens, it gives me the trial version 5 at a time warning. But it doesnt do anything at all to the image. Also installed John’s Big Note plug in and added it to a metadate preset but it’s not showing up anywhere. Thanks. Pretty sure I’mm have wonderful things to say once I figure it out. 1. In the profile in Develop> Camera Callibration> Lens Profile. I have only Fujifilm FinepixX100, X100s, & X100 T being displayed in models and the Profile reads as Adobe Fujifilm with the above 3 model names. I don’t get Fuji XT 2, nor the simulations . The problem is that the X-T2 isn’t supported in 5.7, Sree. You would need LR6 or 7 “Classic”. Thank you so much for an amazing program! It (almost) makes using Lightroom tolerable! there is a way to apply the plugin directly at the import of the pics? No, sadly Adobe don’t allow plugins to interact with the import process. I ran the plug-in and it applied the Acros simulation. So far so good. What I didn’t expect was that by doing so it “killed” the HSL/Colour/B&W panel – I can’t do any luminance adjustments anymore. It says “Monochrome profile applied”. Is the what is meant to happen? I thought I could still, for example, adjust the blues for a dramatic sky. If this is what is meant to happen, what is the easiest way to undo the profile application for all photos? I feel like I am missing something quite obvious here…or is it a side effect of the upgrade to LR Classic CC (which must be the most confusing rebranding ever). Hi Kat, glad you like it! You are not missing anything, and it’s not connected to Classic. The Acros and Mono profiles generate a pure B&W image. That might be OK if you chose the perfect Acros+ look when you took the picture, but it’s not ideal if you want to fine tune the B&W conversion or even switch back to colour. So for B&W, I prefer to use my own B&W presets – see the screenshot above. I would suggest using the normal Sync Settings method in Develop to change them back. Or run the plugin again with settings like I’ve done above. I’ve been using the plugin for a while and love it. However, i added it again while using the same catalog on another computer. The problem is now it runns the plugin twice (once not the way I want it) so that when I checl the ‘History’ it shows two entries for jb X-LR. How do i delete everythign and start again? I have tried reset in the plugin manager. It’s now also not remembering my pre-set choices and i need to enter them again every time. What am I doing wrong? My appologies I have it working. Your plug-in is great and I highly recomend it. Am I right in saying that when using expert mode is works in two stages, once setting shadows/highlights etc using expert mode and once applying film simulation? Is that why there are two entries in the history for jb X-LR? Anyway it seems to be giving the result I want. Sorry to take up space here. Yes, Expert Mode runs as a second set of adjustments, producing the two entries in History. Then provide enough detail for me to understand what the problem may be. can this also work for Adobe Camera Raw accessed through Bridge. That is y standard workflow, and that would be awesome if it did. If so, how does one make that happen? Unfortunately not. It does need Lightroom which can handle the kind of coding that is needed for the plugin to work. You can use the plugin in LR, then save the XMP which will set the correct profile in Bridge/ACR – but that’s not very convenient. ok, thanks. Is there a way to make it automatically apply to all images so you dont have to file- plug ins etc for ea pic? The best you can do is select all the images in LR, run the plugin, and then save the metadata back to the files. So not totally automatic, but certainly on batches – I ran it on a shoot of almost 4000 images last month. Thanks for the amazing plugin! Just checking to see if this is an error or if it’s because there’s a “full” version to come? Thanks again for a great piece of software. Two things are likely here, Rhonda. One is that you haven’t entered the registration code correctly – eg a space at the start and end. Have you got the green check mark? The other is that in LR’s Plugin Manager the registration code box is empty because LR hasn’t recorded it properly. Here I recommend re-entering the code, then immediately restarting LR. Let me know if it works + glad you like the plugin. A lot of work went into it! Using LR CC on a mid 2011 iMac. Tried downloading and installing X-LR plugin several times. Restart LR everytime I added plugin. You said in one of your threads to point plugin manager to unzipped “folder” not plugin itself. Every time I unzip the download, I get only the plugin, no folder. As result the plugin is grayed out. Yes I followed all steps repeatedly. Yes the plugin is enabled and running. Tried it wth both raf and dng files. Nothing, just a grayed out plugin. Whenever you can get to my email, I ‘d appreciate your help . Thanks. It’s not clear to me where the plugin is grayed out, but I wonder if Adobe’s odd way of displaying plugin menus is the problem. 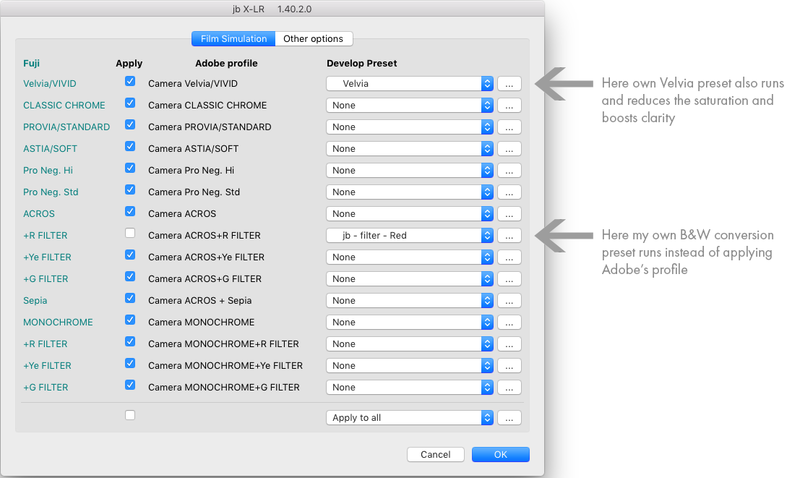 The plugin’s title “jb X-LR” is itself grayed out, but the Apply…. should be enabled. I’ll attach a screenshot. Does this help? Thanks for pointing out the “Apply the film…” note. Not sure why I didn’t see it before. Guess I was focusing too much on the grayed out tab. Anyway problem solved. Thanks again and I will be purchasing this plug-in. Keep up the good work. Hey, Ed, you probably didn’t notice it… because I only added the screenshot after reading your comment. You are not the first person to be confused by how Adobe display these menus, but maybe you’ll be the last! What version of the plugin, Assaf? It’s shown in the title bar of the dialog box. Also what options are you setting in the dialog box? Is this with a raf or a dng? It may be better for me if you can share the file and screenshots. Dropbox? I just bought your plug-in, loaded it to LR as per your instructions, but the message I get from LR when I wish to use it is Installed But Not Working. Why is that ? You don’t give me enough information to make a good guess – Lr version? Mac or PC version? When / where do you see that message? But I would suggest you remove the plugin from LR (via plugin manager) and from your computer (via finder/explorer), then download and re-install again, checking you installed correctly. Don’t try to install it in your Downloads folder, put it somewhere else like in Documents. That really implies it isn’t correctly installed, Manesh. Which folder is it installed in? Documents? In Plugin Manager, are you adding the actual lrplugin package? It’s not inside another, is it – I’ve seen errors where people create a folder with .lrplugin as the extension put the plugin inside it, and then try to add the folder in Plugin Manager. Have you restarted LR, Mahesh? What about the Enable / Disable buttons, and can you press Enable? Are any error messages showing in the Plugin Author Tools section? Finally got it. The zip file version worked. The direct download version did not. Thanks for your help for so far. Could I just clarify what you mean by “zip version” and “direct download version”? Could you be using Safari, which seems to put a plugin directly into Downloads so you never see a zip file? When I use Firefox, I download a zip file. When I tried to download the file, I got asked whether I wanted the zip version or the plud-in. I chose the plug-in, and thus ran into all sorts of problems. After I downloaded the zip file, and followed the instructions on your web page, it worked out fine. I’m using iridient X to convert .raf files to .dng and then import it to Lightroom. since i download your plug in today it open all the photos in Lightroom in black & white and i can’t change it back. the photos are open in B&W even though they where shot in a another film simulation. what does it happen and how can i fix it? Did you also post in Adobe’s forum? I may have just answered this question. It sounds like in the Import dialog box you are applying a Develop Preset which either converts the image to B&W or applies a Camera Calibration panel profile such as Acros or Mono. Or you might have saved your own default in LR and selected the Acros or Mono profiles. The plugin would not do this without being told to do so. I bought the plugin and I find it powerful. Anyway, I’d like to use use presets that have their own calibration profiles, is that possibile to override the native fujifilm profile? for example I love VSCO FILM presets, they have their own calibration profiles. Generally I shot Classic Chrome for the pictures I’ll process in color and Monochrome for the pictures I’ll process as BW. When I run the plugin I’d like it to apply the right preset based on the Fuji film simulation but not applying the Fuji profile. Is it possible? Yes, you can do that. Just create a preset which applies the 3rd party profile that you want to use, and specify it for that film simulation. I would also untick the box next to Adobe’s FS, so you can be sure that only your preset will be used. > will I have to reload it to LR when I get the full version? > does the plugin allow me to take a picture that was shot in Provia and turn it into Acros mode? It doesn’t *prevent* you doing so. Its role is to *automatically* set photos to Provia if you shot Provia, Acros if you shot Acros etc. You can do that. It sounds like you need to review the first paragraphs on this page. Imagine you shot 200 pictures on a day, starting with Velvia, then Provia, then Acros R, then Acros G, then Provia. The plugin’s role is *automatically* set photos shot in Provia to Provia…..
Oops, lightroom 5.7 doesn’t recognize Fuji XP2 RAFs. Stopped dead. They are uncompressed if memory serves, but I don’t remember 5.7 accepting them compressed or uncompressed .. Simple answer is that you need to upgrade Lightroom. First, it will support the XPro2, and secondly the raw conversion of Fuji files is better. In Lightroom 5.7 you would see film simulations for cameras that it supports, but the Xpro2 came out about a year after Lightroom 6.
i’ve downloaded the zip, unzipped, added in plug in manager and purchased. but it will not let me register and thus can only update 5 photos at a time. i’ve tried plugging in a few numbers from email from paddle including order/invoice number, transation code and vat number. i dont even get an option to click “register.” help! I have resent the email containing the registration code (which starts XLR-9….). Let me know if you don’t get anything. Sorry about the email address error, I’d missed an ‘s’ out in my own name…maybe I should be kept away from computers! Ross, I’ve replied via email – hopefully it’ll get to you this time! I have downloaded your jb_XLR.lrplugin and I can’t get it to work. I have followed the install instructions ie via Lightroom Plug-In Manager which says the plugin is installed and running. If I select a photograph in the Libray or Develop modules the plugin shows up when I go to ‘File’ > ‘Plug-In Extras’. ‘jb X-LR’ is greyed out but ‘Apply the Film Simulation profile to the selected photos’ is clickable. When I click it the and tick ALL the ‘Apply’ boxes (including ‘Apply to all’ the Lightroom progress bar ays that ‘jb_XLRextracting information’. When I go to the ‘Camera Calibration > ‘Profile’ window in the Lightroom Develop module all that is visible are the usual profiles eg Adobe Standard Kodak Gold, Camera PROVIA/STANDARD etc. There is no sign of Acros or Classic Chrome. For reference, I am using Lightroom 5.7.1 on a Mac running OS10.7.5 and my cameras are a Fuji 100S and a Fuji XE-2. Can you please let me know how to get the plugin working. Hope to h4era from you soon. Didn’t realise my previous response would be public…can you please delete my email address, registration code and order number? Done. I tried to email you but got a rejection for that email address. Can you email me so I can deal with this. Did just buy your plug-in. Works fine with film presets. But I can’t get the rating to works. Tested on both X-T2 and GFX. Just got a new computer do I need to buy another license? No, you’re OK. As many computers as you need. You probably haven’t unzipped or installed it correctly, so I suggest removing it through the Plugin Manager, downloading again, and re-installing. Windows or Mac? Its windows 10..ok Ill try deleting it and downloading unzipping and selecting again. Make sure you point to the lrplugin which looks like a folder, not to a file inside it. OK once I created a new folder to unzip it to (outside of downloads) it worked fine. My own personal preferences is to keeps plugins in a Dropbox folder, which means I only update once and both my computers are updated. To me it is not very clear how this plugin works. What does it add extra? Imagine you go out and shoot raw. 15 pics are Acros Red, 12 you did with Acros Green, 35 with Provia. Now get them in Lightroom – they’re all colour. The plugin automatically sets the profiles based on what you shot. Ok I paid for the plugin, I clicked the download, now where is it? When I press download it brings me to this page. It’s the big button at the top right of this page – next to the buy button. An Internal Error has Occured. I installed the plugin selecting the folder i created for the plug in located on my desktop. I see the jb file but it gives me the error after I select Apply the Film Simulation profile to selected photos. I think this is because you haven’t pointed to the lrplugin itself. So don’t select a folder that contains it, and don’t select a file inside the plugin. ^ that is where the I placed the plug in. Then I load a DNG file image go to File > Plig-in Extra > Apply the Film Simulation Profile to selected photos and I get the same error message. Then I go back to Lightroom Plug-in manager and not jb X-LR is installed; may not work. I added a folder in Lightroom > Modules and added the xb_XLR.lrplugin there. When I go to the plug-in manger I noticed that the XB X-LR plug in is disabled, I then enabled it. But still gives me the error. So where is the plugin, Louie? It should not be in User > Library > Application Support > Adobe > Lightroom itself, so remove any copy that may be there – Lightroom may be executing it automatically. Check the plugin’s path in the Status section of Plugin Mgr. In fact, it may be best to delete any copies you have, then download and install again. Personally, I prefer a location like the desktop or Dropbox, but that Modules should install it automatically. I think it is an installation issue, but if not feel free to email me with a DNG. Ok so I just deleted all copies of the plug-in. I re downloaded the file, created a folder on my desktop (untitled). Added the plug-in in lightroom > restarted lightroom > I receive the same error. The store presets with this catalog is unchecked. I am not using a catalog, just a single DNG image is uploaded. Also, what is your setting in Preferences / Presets / Store Presets with Catalog? Are you using multiple catalogues? 2. Screenshot of the Status section of Plugin Mgr. Just updating the thread. The issue appears to be a corrupt/encrypted pre existing preset on my Preset Folder, once removed, the plugin worked. Regardless of the issue, this is a great plug-in. Fast support from John who was very present with assisting me. When I buy your solution the download is not working. Can I use the trial version and enter the Licence Code? Download it from this page and enter the licence code. The version number is 1.40. Hopefully it all makes sense! Bought the plug in. Installed it tried it on some new files worked perfect. RAW r to Acros G perfect.Uploaded more files to a new folder tried it again does not work. Says extracting but never changes the file simulation. Windows 10 Lightroom 6.5 …errrrr!!! Rebooted, unloaded the plug in reloaded it….still nothing.. The kind of things that might cause this…. Have you unchecked any of the Apply boxes? Check them all – unless you want to ignore a film simulation. Are you sure you aren’t processing JPEGs? Have you checked the Camera Calibration Profile? Is that why you say “never changes the file simulation”? Try changing all the film simulations to Adobe standard, then re-running the plugin. If you enable the keyword option, do the images get the expected keywords? I figured it out! I was mistaken that this tool would let you select raw files after import and pick a film simulation profile and apply that selected profile to any or all of the raw files independently of how they were shot. I see now that it not the case, that this will only extract and set the as-shot film sim to the raw file if it is selected. Or if all are selected. If you shoot in Provia and Provia is not selected it will do nothing. I get it and this makes sense and works great. Some people get the logic immediately, others don’t – and that’s as much my fault as theirs! In the next version I will try to make this aspect more obvious. Almost, it will not apply Adobe’s profile, but it will apply any preset. So you might choose not to apply Adobe’s Acros profiles and instead apply your own B&W presets. Hi, I downloaded your plugin last night and starting using it today. I am using LR CC 2015. Have you had any issues with the FILM SIM Acros showing up very blue when applied. As I import them, I see the correct BW preview, but then it converts to the blue.. Am I doing something wrong? Any advice would be appreciated. Are you applying a preset while importing? Also, blue could be down to monitor. Calibrated it recently? But on its own, XLR and the Acros simulations wouldn’t turn pictures blue. Regarding the questions and replies on May 25 regarding the X-T2 and LR5 it also appears that X-T2 .DNG files created by Irident X Transformer don’t have their film simulation profiles recognized by LR5? That’s because the XT2 is more recent than Lr5 and so its film simulations don’t exist in Lr5. Not much I can do about that. What you could do is upgrade Lr. If you don’t want to do that, I think you could uncheck all the Apply boxes and use the film simulations to add presets instead. Would that about sum it up. I might just test it though…. Yes, that is what it does. Plus other things too. Hi I’ve successfully downloaded the plugin and it’s available in plugin manager. However when I select File>Import Photos and Video the LR menu bar becomes blacked out, meaning that while I can select photos in the import dialog I have no access to the menu to select File>Plugin Extras. Operating system is Windows 10. Please advise what am I doing wrong? You don’t run this plugin in the Import dialog (Adobe don’t allow it), but after the photos have been imported. Aha thank you John. Maybe worth clarifying in the “How to Use” instructions that it’s not applicable in Import process, only to already imported files. I guess I should have realised that from your comment that it can be used in “Develop”. I probably should have mentioned that I’m on an iMac running Sierra and using the latest version of LR CC. I purchased the plugin, received PayPal confirmation and an email with my registration code. Installed exactly as directed on the website, opened it in plugin manger and entered the registration code, and tried to use the plugin, but each time I do, it pops up a box that says the Plugin Has Expired. I’ve re-entered the code several times, re-installed the plugin (which LR says is enabled and running, but always the “expired” message and nothing happens. I saw the “retrieve registration code” box and tried that to see if I got the wrong code, but the link took me a website titled “photographer’s Toolbox by Arctic Whiteness” which says it has no record of any transaction with my email address. Just install the current version 1.40, either by using the automatic method in Plugin Manager, or manually by removing the existing plugin and downloading the current version. Thanks! That was the problem. Working great now. Now that I’m using it, I have one other question: After applying the plugin, the photos have a tag that states, “The metadata for this photo has been changed by both Lightroom and another application. Should LR import settings from disk or overwrite disk settings with those from the catalog?” I’m guessing that the overwrite option is the correct choice, but would like to be sure. Thanks again for your great plugin and response to my first post. Yes, in general overwrite is the correct option. An exception might be where you have used some other app to update the photos outside Lightroom. Thanks for the info about Artic Whiteness – that link is a bug. Hi, I just installed version 1.40.1.0 on Lightroom CC 2015.10 [Windows] and later 2015.10.1 but it won’t find the Fujifilm simulations for my X100F [firmware 1.01] RAW files – only the standard Lightroom presets show up on the “Develop Preset” selections. Am I missing something? Have you changed any options in the dialog box? For instance, I recommend leaving all Apply boxes checked – unless you specifically want to ignore a certain FS. No; I did not change anything. So when you click OK, go to the Camera Calibration panel in Develop. Does this show the FS you used when you shot the photo? So the plugin is correctly reading the FS from your X100F. Apparently it does. However, the FS do not show up on “Develop Preset” selection – there I only find the standard Lightroom presets. Disregard! I installed Lightroom new and now I get the exact same picture (except your personal customizations^^) as shown above. I get the film simulations but under the profile all it says is embedded, not what the film simulation is? It sounds like you are looking at a JPEG. Folks, you can really buy here – this plugin rocks!!! And so does John! As you will see below, two days ago I had found one special configuration where it did not work as expected – mainly because of Fuji’s own irrational metadata setup in-camera. Not only did John respond extremely fast, he also extended his plugin immediately to cover the problem. The plugin REALLY works like a charm!!! i installed the plugin, but still do not open the X-T2 raw file on LR5. how can i do . but you mentioned :The plugin is tested on Mac and PC, and for Lightroom 5 or later. Because it works fine in Lr5 and processes Fuji raw files imported into Lr5 – X-T1 files for example. Your problem is that the X-T2 is too new for Lr5, which is unable to import its raw files. So you need to upgrade Lr to support your camera. John,sorry i do not understand,because the LR CC is include Film Simulation in Camera Calibration,why I still need your plugin ? have another function ? Just read the first two paragraphs at the top of the page, Dan. Have you ticked the box on the Options tab? Just sent you a mail! Not always! You got lucky. LR run under Windows 7 Pro x64. I want to test your plugin with my X100F RAF files. It sounds like it is [not] properly installed, Marc. In Plugin Manager, remove and then add it again. But be careful to point to the lrplugin folder, not to a file inside it. Let me know. Hi, sorry for the delay, you’re right. Since that the plugin was removed and reinstalled inside Lightroom, its works. Just purchased the plugin nice work! Has the plugin been tested / upgraded to work with the X100F files? It should not need updating, Sebastian. I suggest you test this a bit more, but I will be looking into it too. Thanks, I did check and couldn’t see anything wrong. In Plugin Manager you can change the parent keyword. Have you seen that? OK, it will be in the next revision. Maybe next week. Hi! Just purchased the plugin and I love it already! Is there a way to apply the profiles already during import? Thanks! Unfortunately not, Matthias. It would make sense, but Adobe don’t allow it. Glad you like the plugin! When i go to “Plugin extras” I see and can call up “Apply the film simulation profile to selected photos” – the next window (whicg takes a long time to open) shows the list of Fuji film simulations,with an “apply” check box next to each name. There is no “run” button/option, only “OK” at the bottom right of the screen. BTW i paid for the full version over the weekend, I’d love to get this working! Thanks for pointing out the OK rather than the older Run – I have updated the page. The slow startup may be because you have a lot of presets? I am working on an option to improve that. You say Adobe 2012. So is that Process Version 2012 and Adobe Standard as the Profile? Not Provia or Velvia etc? I assume you left all the Apply boxes checked – you should, at least at this stage. Try checking the option to store the data extracts and examine the text file – I had one similar report which turned out to be a corrupt file. “Process Version 2012 and Adobe Standard as the Profile” – Yes, thats what I see. I hadn’t checked “apply all” – i have done that now and it read the Classic Chrome profile from my RAw file, so all is good now! Great! I leave all the apply boxes enabled, except if I want to exclude ta certain film simulation. Hi, I noticed that my Fuji X100F jpegs’ colors are different if I exported from an RAF file via Lightroom, does XLR helps resolve this issue? Or does it still utilize the profile by Adobe? If by “my Fuji X100F jpegs” you are referring to JPEGs directly from the camera, yes. Just give it a test and see if it works as you think. The trial version works with 5 photos each time. Quick question, I have just begun to use Irident Transformer for import. It converts the raf files to dng. Any chance this would work for dng files? Dang. Don’t know how I missed that! Thanks for the update. I have resent them. Check your spam folders too. If you still don’t get them, email me. i will send you an email because I still didn’t receive it. just bought the plugin, and paid through PayPal. When installing it asks for a registration code which is not mailed. When I try to retrieve the registration code it says that it doesn’t recognise my email. I tried both my ordering email and my paypal email address. I’m afraid I lost my money not getting any registration code after ordering. What name did you use to buy the plugin? I see no record of your cardio@kabelfoon.nl email address on the system. We will resolve it. I’d like to find your details on the system, but I’ll issue you a free licence if all else fails. I just purchased this plug-in but seems not working.. I tried to apply Sepia profile to my xt-2 raw file. After i press run, look down into Camera Calibration section and no Sepia profile. This sounds interesting, but I have a question. I have an older Fuji camera, an X-E1 specifically, that does not provide support for formats like Classic Chrome and ACROS. Will this plugin be able to apply a simulation of those, or will it only give access to the formats available in Lightroom’s camera calibration panel? No, the plugin is all about reading the film simulation you selected when you shot the picture, and matching it to Adobe’s CC panel profile. Thanks John, I’ll probably hold off untill I get one of the newer X range then. It seems like a faith to me buying it. Just read this article yesterday now today is on sale!? How long til it’s on sale? where/how can I buy a license? It will be on sale here, today! Been on the edge of my seat waiting for the finished version. Can I get a serial number or is it all functioning as is? Thanks for all your hard work, be sure I will put my hand in my pocket when the time comes. Patience. It’ll be for sale on the 9th or 10th of May….. I am running Lightroom CC on a Mac OS with Sierra. I do not see the the simulation after I press run in the Develop’s Camera Calibration section. Please help. Thank you. No idea, but is it correctly installed? I’ve no other reports of it not working. Try again and carefully note your exact steps. Thanks for taking the time to do this, I’m sure there will be a lot of grateful users. Too late for beta testing! There will be an introductory discount though. any news, when the unrestricted version will be availabe for sale? a really helpfull plugin, thank you for your work. it is working like a charm with my xt2. I’m looking forward to use the full version. When do you think it’ll be release ? Is there any way to unlock the beta temporarily ? I have a problem with a LRCC 2015.10 version on OSX El Capitan (10.11.16 CPU t5 16GB RAM) . I have used the plugin with X70 RAF files and it boots up veeeeery slowly freezing LR for some 60 seconds (or more). After booting up it applies the presets very quickly but the plugin start up is really frustrating. Anyone else having such issue? I would expect a slow startup the first time, Stefano, because it is a large plugin, but 60 seconds is unusual. Try installing it in a different folder location. Would the logs help you find out what the issue could be? Only in the final plugin. One idea – do you have a large number of presets? Under File – plug in extra – jb X-LR (grey). Then comes: “apply the film simulation profile to selected photos” , which I push enter on to access. I apply one of the simulations and enter “run”, but nothing happens? What am I doing Wrong? How do you know which film simulation was used in the raw file? I’m a beginner – eager to learn. That all sounds right. Now look in Develop’s Camera Calibration section and see if it has applied the simulation profile that you used. Looks really good. I’d also like to get the final version when it’s available as the current version is limited to 5 photos at a time. Any way to get it to save the mapping so you don’t have to redo it every time? I don’t quite understand what you mean about mapping every time, but there is an option in Plugin Manager to run it without the dialog box. Thanks for the XT1 and XT2 information. It’s the second comment about the list of presets so I will see what I can do to improve this. This is solving a problem I had since I started shooting with Fuji cameras 6 years ago! Would love to be on your beta tester list if you need someone that has 4 different Fujifilm m’aimeras and that shoots (and edit) every day. I also have a photography channel on YT (http://YouTube.com/fredranger) and will probably talk about your great plugin! Great plug-in! Looking forward to the final version and the possibility to select more than 5 pictures at once. It works great! Can’t wait for the release! Any hint on how much the plugin will be? I have an idea, but that’s for the future! great plugin! How can I buy it to remove the 5 picture restiction? It’s currently a beta / preview. It will be available for sale from April. Thank you SO much for this! I might actually use Lightroom for my Fuji files again now. I couldn’t believe this was not a built in feature when moving from Canon+DPP to Fuji+Lightroom, and to be honest gave up on lightroom as a result. I would love to register for the fully functional plugin as soon as it’s available. It’s really quite easy to understand, Roger. Camera makers don’t share their picture style or film simulation recipes with Adobe, or other third parties. So Canon picture styles don’t automatically appear in Lightroom. Instead Adobe created profiles to reproduce them, and users could choose them if they wanted. But with mirrorless cameras people always compose with a film simulation, and really want to see them in Lightroom. Hi – tried this out and really like it (XT-2 RAW files). Any plans to make this available in PS – that would be fantastic. No, purely Lightroom. To do it in PS would be automating Adobe Camera Raw, which isn’t possible, or Bridge which isn’t a strong platform for coding. I just bought a Fuji x-t20, and tris is what I was looking for. Ho can I have the use of it without resctriction? Hi, perfect, great to have this. I will definitely buy it, the mentioned expert mode is great for further fine-tuning. Would there be a way to enable this as a ‘parameterized automatic User Preset’ in Lightroom? So the development settings would be applied before the preview render process kicks in. Sorry, not possible. Presets can apply the profile, but don’t have the intelligence to read how Fuji record each photo’s film simulation. I’m confused. I don’t see the fuji film film simulations in the right column when I click on the pop up list. I see some Thomas X-trans settings with similar names, but not the X-trans settings by their original name, as you have in the example photo. That’s if you want to apply a develop preset. Just click Ok, and it will apply the camera profile. It seems to work fine on X-T20 files, but only tested with Across. I have a lot of preset folders, which makes the selection a little hard. Also, maybe indicate that it will apply the calibration profile even if you don’t select a preset (it wasn’t directly obvious to me). I love the plugin! I saw it in Piet’s video on FujiLove. It works great on my X-T2 files and I can’t wait to be able to get a version without the five-image limit. Keep up the great work! This seems to be the solution I have been waiting for! How do I get the full version? By being a little bit patient! This is a beta/preview and I hope to release in April. This is with X-T2 files. No, it’s test with that version of LR. What operating system? Many thanks for this great plugin. Using it with my X100F, and it works perfectly. Thank you for this great LR plugin, I watched the video by Piet. I can confirm it works with Fujifilm x30 Raw files. Downloaded your plugin, but it is grayed out. Will the X100F be supported? Just picked up the X100F as my first mirrorless camera and I’m loving it. I’m hoping it will work with my files. I will be putting it through it’s paces. Thanks for thinking of us Fuji Guys!!!! I am using Iridient X Transformer which converts .RAF to .dng…will your plugin still be able to get the info it needs for film simulation from the created .dng? Yes, see “System Requirements” above. Great – thanks for the feedback! I would love to use your plug in for LR 9.9 with my fuji files. I don’t know how to get it into Lightroom. If you watched the video by Piet, he does show how to do this. But I will add some installation notes to this page. Great idea, I own some, too may, Fujifim X camera, and, the best workflow right now is to use an import preset to set the Lr “Camera Calibration” Profile emulation. So it is import based and I loose the filme Profile selected on the Camera. Some reflexions, taking in acount the ISO setting to set the proper “Details” Noise and sharpening would be of great help. For sure RAW users use the ISO setting. But, that could bring some complicaitons as the Detail settings are not only ISO dependent but also camera dependent. That may be in an “expert mode” which lets the user figure out the Fuji data and enter the parameters in a text file.